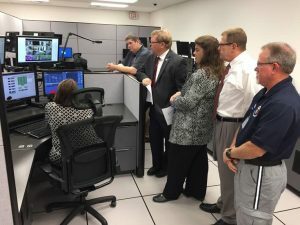 The Rutherford County Emergency Communications District (RCECD) recently hosted 37th District TN State Representative Dawn White and 34th District TN State Representative Tim Rudd and Tennessee Emergency Communications Board’s (TECB) Director of Government and External Affairs Amber McDonald. for a tour of the District. 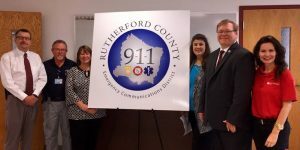 Director Steve Smith addressed current and emerging changes in 911 technology, characterizing upon the importance of ‘Next Generation 911’ capabilities for Rutherford County. Also in attendance was RCECD Assistant Director Cassie Lowery, RCECD Operations Coordinator Matt Lane, and Rutherford County Emergency Medical Services Station Manager Scotty Blackburn. Assistant Director Cassie Lowery demonstrates the District’s NG911 call processing technology in the RCECD Auxiliary PSAP. (From L-R): RCECD Assistant Director Cassie Lowery, RCECD Operations Coordinator Matt Lane, Representative Tim Rudd, Representative Dawn White, RCECD Director Steve Smith and Rutherford County Emergency Medical Services Station Manager Scotty Blackburn. 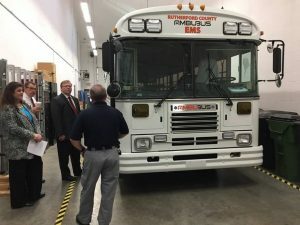 Rutherford County Emergency Medical Services (RCEMS) Station Manager Scotty Blackburn provided a briefing to Representatives White and Rudd on the RCEMS ‘Ambubus’, which is a mass casualty medical treatment and transport unit. The ‘Ambubus’ was on standby at the time in the event medical evacuees from Hurricane Harvey were received in middle Tennessee. The Rutherford County Emergency Communications District currently is assisting RCEMS by providing storage space for the unit. RCEMS constructed the unit with grant funding from the Tennessee Healthcare Coalition. (From L-R): Representative Dawn White, RCECD Director Steve Smith, Representative Tim Rudd and Rutherford County Emergency Medical Services Station Manager Scotty Blackburn. (From L-R): RCECD Director Steve Smith, Rutherford County Emergency Medical Services Station Manager Scotty Blackburn, RCECD Assistant Director Cassie Lowery, Representative Dawn White, Representative Tim Rudd and TECB Director of Government and External Affairs Amber McDonald.